Huawei's subsidiary company Honor, has launched a new flagship device called the Honor 8 in India. The device flaunts a 5.7-inch QHD 2560 x 1440 pixels, with 515 PPI, 94.5% NTSC color gamut which is close to DCI-P3, LTPS LCD display with Corning Gorilla Glass 3. The device has a 79% screen to body ratio. The phone runs on Android 7.0 Nougat with Emotion UI aka EMUI 5.1 skin on top. The Honor 8 Pro is powered by Huawei's octa-core Kirin 960 processor, a Mali-G71 and 6GB of RAM. The phone has 128GB of internal storage, and supports up to 128GB of expandable storage via a microSD card which is part of the Dual SIM Hybrid SIM card slots. 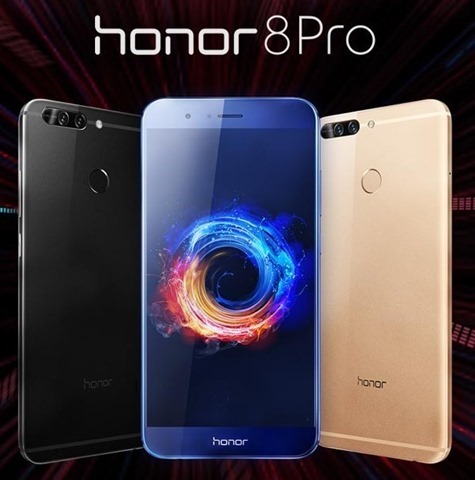 The Honor 8 Pro features dual rear cameras, with the sensors comprising of two 12 megapixels monochrome and RGB lenses, with an f/2.2 aperture, paired with laser autofocus, an LED flash and is capable of capturing 4K videos. The selfie lens on the device, is an 8 megapixel front camera with a 77° wide-angle lens. The back panel also houses a fingerprint sensor. The Honor 8 Pro has been priced at Rs. 29,999, and will be sold exclusively via Amazon India’s website from 6PM on July 10th on Amazon Prime day, and HDFC credit and debit card users can avail a 15% cashback offer. The phone will be sold via open sale from 13th July. The device will be available in 2 colours: Navy Blue and Midnight Black. The box which the device comes in, can be used as a VR headset. On paper, the Honor 8 Pro beats the OnePlus 5, both in terms of price and technical specifications. But we can’t tell for sure without testing them.